One doctor's passionate and profound memoir of his experience grappling with racial identity, bias, and the unique health problems of black Americans. When Damon Tweedy first enters the halls of Duke University Medical School on a full scholarship, he envisions a bright future where his segregated, working-class background will become largely irrelevant. Instead he finds that he has joined a new world where race is front and center. When one of his first professors mistakes him for a maintenance worker, it is a moment that crystallizes the challenges he will face throughout his early career. Making matters worse, in lecture after lecture the common refrain for numerous diseases resounds: ''more common in blacks than whites.'' In riveting, honest prose, Black Man in a White Coat examines the complex ways in which both black doctors and patients must navigate the difficult and often contradictory terrain of race and medicine. As Tweedy transforms from student to practicing physician, he discovers how often race influences his encounters with patients. Through their stories, he illustrates the complex social, cultural, and economic factors at the root of most health problems in the black community. These elements take on greater meaning when Tweedy finds himself diagnosed with a chronic disease far more common among black people. 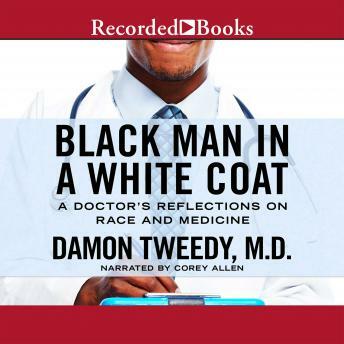 In this powerful, moving, and compassionate book, Tweedy deftly explores the challenges confronting black doctors and the disproportionate health burdens faced by black patients, ultimately seeking a way forward to better treatment and more compassionate care.